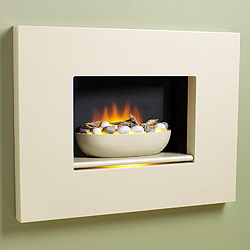 The Karma Athena Hole in the wass electric fire is a Modern Electric fire designed for use either wall-mounted or recessed. You can Select from a Black, Silver, Black with Silver or optional extra Glass Fascias in Mirror Or Black (shown in picture opposite) for an extra cost . On this Karma fire the Flame effect can be used independently of heat. The Fan heater comes a with choice of 1kW and 2kW heat settings. You can also choose from Pebbles, Driftwood As in the picture opposite or Limestone chipping Fuel effect. this fire has a Depth of 171mm projection off the face of the wall if not recessed and Semi inset spacer allowing 75mm to be inset into the wall or a Fully outset version with 125mm Spacer to hang the product on the wall. 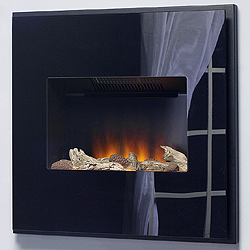 The Karma Exhibit is another fantactic hole in the wall electric fire made by Karma Fires. this hole in the wall fire has a flame effect setting so you have have a display without any heat also has a 1kw setting and the maximum setting of 2kw. Comes with manual control as standard and you can upgrade to a remote control. The picture oppisite is the Beige Marfil Stone effect Modern fire bowl on a matching shelf with the Driftwood and Pebble fuel effect and can also come in a stylish white colour.